Ginisang Red Munggo Beans. While searching for kadyos beans at a supermarket the munggo beans caught my attention. 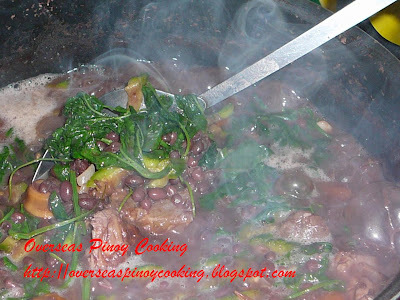 I never thought that there are red mung beans in addition to the regular green colors that we normally use in Pinoy cooking, and the black and yellow colored mung beans. I bought a packet to try and cook ginisa similar to the usual way of cooking green mung beans. I was expecting that the shells would rise once the beans start to disintegrate like the green mung beans, it didn’t. Now I realized also that it is the same or perhaps similar bean variety of the red small beans that is used in halo-halo. Other than that it was great, a great Pinoy comfort food at that. 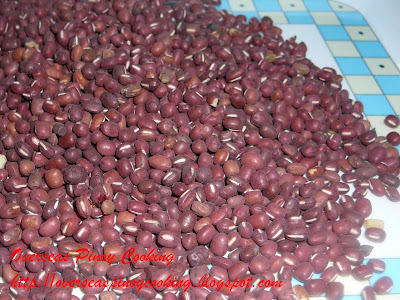 Wash red munggo beans, check and remove stones that might have mixed with the beans. Put in a medium size pot and add water to cover, bring to a boil for 2 to 3 minutes drain and discard first boiled liquid. Add fresh water up to half full and bring to a boil. 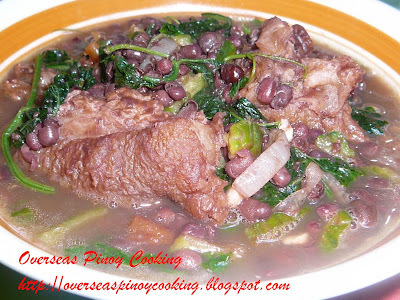 Simmer for 45 to 60 minutes or until beans disintegrate, add in more water as necessary. In another sauce pan sauté garlic, ginger, onion and tomato. Add pork and patis, continue to stir cook for another 3 to 5 minutes. Add sautéed ingredients to the boiling pot of red munggo. Add in ampalaya and eggplant, cook for 3 to 5 minutes or until ampalaya are cooked. Season with salt if required. 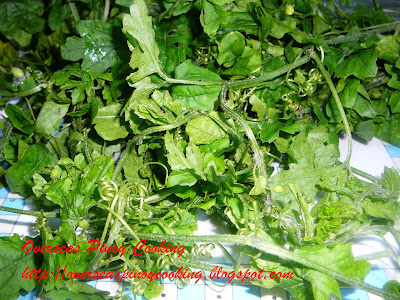 Add in ampalaya leaves/tops and continue cooking for another 2 to 3 minutes. Serve hot.